Bath towel There are 4 products. 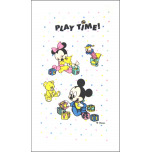 Bath towel terry-towel, 70X130 cm, PLAY TIME Mickey - Minnie baby Disney, 100% cotton, print Disney, on white background, very good quality, very good absorption, can be washed up to 95 ° C.
Ivory bath towel, 60x120 cm, 100% cotton, gray and white rabbits, my lucky star. 50x100 cm Towel or 70x130 cm Bath towel 100% cotton green terry, 530 gr/m², Whale and small multicolored fish embroidered. 50x100 cm Towel or 70x130 cm Bath towel 100% cotton beige terry, 530 gr/m², embroidered nature drawings.